Plants cespitose, not rhizom-atous. Culms 35-90 cm tall, 0.7-2.2 mm thick, lower internodes glabrous, puberulent to 5 mm below the nodes; nodes 2-3. Basal sheaths mostly glab-rous, margins ciliolate distally; collars glabrous, including the sides; basal ligules 0.2-0.5 mm, truncate, ciliolate, cilia to 0.1 mm; upper ligules 0.2-3.5 mm, rounded to acute; blades to 30 cm long, 1-3 mm wide. Panicles 10-25 cm long, 0.5-1.5 cm wide; branches ascending to appressed, straight. 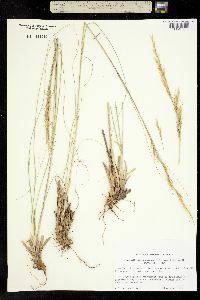 Spikelets appressed to the branches. 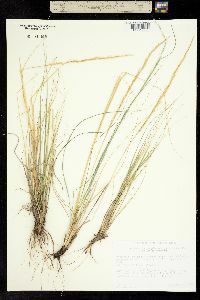 Glumes unequal; lower glumes 10-15 mm long, 0.5-1.1 mm wide, exceeding the upper glumes by 1-3(4) mm; florets 5.5-11 mm long, 0.7-1 mm thick, fusiform, terete, widest at or below midlength; calluses 0.4-0.6 mm, blunt; lemmas evenly hairy, hairs at midlength about 1 mm, apical hairs 1-2 mm, ascending to divergent, apical lobes 0.2-0.5 mm, membranous, flexible; awns 10-19 mm, persistent, once(twice)-geniculate, basal segments scabrous, terminal segments straight; paleas 2.8-5.6 mm, 1/2-2/3 as long as the lemmas, hairy, hairs not or scarcely exceeding the apices, veins terminating at or before the apices, apices acute to rounded; anthers 2.5-4 mm, dehiscent, not penicillate. Caryopses 3-6 mm, fusiform. 2n = unknown. Achnatherum perplexum grows on slopes in pinyon-pine associations of the southwestern United States and adjacent Mexico, at 1500-1700 m. It flowers in late summer to early fall. It has generally been confused with A. scribneri, A. nelsonii, and A. lobatum. It differs from A. scribneri in the glabrous collar margins of its basal leaves and its blunt calluses; from A. nelsonii and A. lettermanii in its unequal glumes; from A. lettermanii in its relatively short paleas; and from A. lobatum in its shorter lemma lobes and ascending to divergent apical lemma hairs. 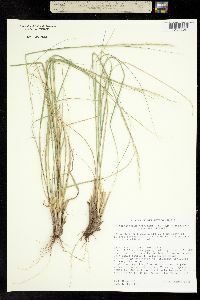 Perennials, Terrestrial, not aquatic, Stems nodes swollen or brittle, Stems erect or ascending, Stems caespitose, tufted, or clustered, Stems terete, round in cross section, or polygonal, Stem internodes hollow, Stems with inflorescence less than 1 m tall, Stems, culms, or scapes exceeding basal leaves, Leaves mostly basal, below middle of stem, Leaves mostly cauline, Leaves conspicuously 2-ranked, distichous, Leaves sheathing at base, Leaf sheath mostly open, or loose, Leaf sheath smooth, glabrous, Leaf sheath and blade differentiated, Leaf blades linea r, Leaf blades very narrow or filiform, less than 2 mm wide, Leaf blades 2-10 mm wide, Leaf blades mostly flat, Leaf blade margins folded, involute, or conduplicate, Leaf blades mostly glabrous, Ligule present, Ligule an unfringed eciliate membrane, Inflorescence terminal, Inflorescence a contracted panicle, narrowly paniculate, branches appressed or ascending, Inflorescence solitary, with 1 spike, fascicle, glomerule, head, or cluster per stem or culm, Flowers bisexual, Spikelets pedicellate, Spikelets dorsally compressed or terete, Spikelet less than 3 mm wide, Spikelets with 1 fertile floret, Spikelets solitary at rachis nodes, Spikelets all alike and fertille, Spikelets bisexual, Spikelets disarticulating above the glumes, glumes persistent, Spikelets disarticulating beneath or between the florets, Rachilla or pedicel glabrous, Glumes present, empty bracts, Glumes 2 clearly present, Glumes equal or subequal, Glumes equal to or longer than adjacent lemma, Glumes 3 nerved , Lemma coriaceous, firmer or thicker in texture than the glumes, Lemma 5-7 nerved, Lemma body or surface hairy, Lemma apex acute or acuminate, Lemma distinctly awned, more than 2-3 mm, Lemma with 1 awn, Lemma awn 1-2 cm long, Lemma awn from sinus of bifid apex, Lemma awn once geniculate, bent once, Lemma margins inrolled, tightly covering palea and caryopsis, Lemma straight, Callus or base of lemma evidently hairy, Callus hairs shorter than lemma, Palea present, well developed, Palea membranous, hyaline, Palea shorter than lemma, Stamens 3, Styles 2-fid, deeply 2-branched, Stigmas 2, Fruit - caryopsis, Caryopsis ellipsoid, longitudinally grooved, hilum long-linear.